Winners of Entrepreneurs of the Future Award 2003 for innovative business plan and João Borges 2010 Award by the Mayor of Funchal City for good practices in tourism, nature conservation and nautical activities. A 12 seats rib with crew dedicated to your experience of search for dolphins and whales swim and snorkel with wild dolphins off Madeira, Portugal. Ideal gift for honeymooners or anniversaries! 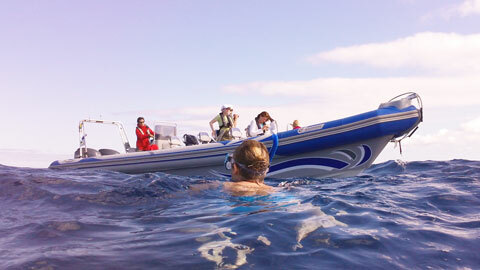 This exclusive/private RIB charter is fully dedicated to swimming with dolphins in Madeira, Portugal. Suggested by our clients that desired a more private experience, i.e. honeymooners, families, groups of friends. It is always important to note that dolphin behaviour will decide the swimming possibility. And we will do our best to transform this day in a memorable lifetime experience. As an added value we will do underwater film of your group snorkelling with the wild dolphins and later digitally send to you. All exclusive trips are assisted and filmed by our expert swimmer, familiar with dolphin activities and movements, that will be with your group in the ocean. For this activity we use our Oceanic RIB Oceanodroma, 11 meters long and has two outboard engines of 200hp each, plus all the safety equipment. At our Marina, Quinta do Lorde we provide hot shower rooms. We want to make your exclusive memorable experience. Pick up location: Machico Harbour, Machico city (Southeast Madeira, VR1 Dual carriageway, exits 25 and 26). Easy parking close to the harbour. Transfer is available on request for a surcharge. Return details: Machico Harbour or original point of pick up. Photography: Allowed and recommended. There is a possibility of your equipment getting wet with salt water spray. Do you have any doubts or questions? Visit the FAQ Section or contact us.